I wonder how people will look back on this defeat when Federer's career is over. After what was (by his standards) a mediocre 2008, tennis's greatest practitioner reclaimed his supremacy last year. Winning the French Open silenced all those who tried to deny him his place in the game as the best ever. He triumphed over Andy Roddick in a marathon encounter to regain the Wimbledon title (although after that match between John Isner & Nicolas Mahut, the term 'marathon encounter' may have been redefined). And away from the court, his wife gave birth to twins. The brief but harsh winter had subsided in the Federer garden, and all was rosy again. But how long for? Although he put on a tennis clinic to beat Andy Murray in the final of the Australian Open, he hasn't won a tournament since. Something that had always accompanied Federer in his professional life was serene certainty. 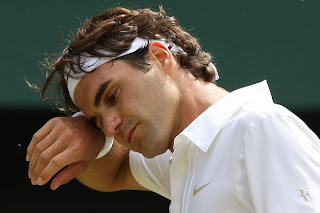 In the same way that you know Matthew McConaghey will always ends up with the girl at the end of any film he's in, you knew that Roger Federer was always tennis's Number 1, accumulating the sport's big prizes seemingly at will. And if he wasn't victorious, you knew he'd be damn close. Over a period of six years he reached 23 consecutive Grand Slam semi-finals or better. A testament not only to his consistency but also his physical endurance. And then tennis fans were stunned after he surrendered his French Open crown this year to Robin Soderling at the quarter-final stage. Federer? Losing in the quarters? Never. In the pre-Wimbledon tournament in Halle - which is unofficailly Federer's personal fiefdom - he lost in the final to Lleyton Hewitt. Federer? Losing at Halle? Never. Well never has now become sometimes. The signs have been there, amd most of us chose to ignore them. Federer's greatness has become the constant of our sporting generation. And it could be coming to an end. The certainty and serenity that accompanied him is gone. In the film, 'Iron Man 2', the story's villain, Ivan Vanko says, "If you can make God bleed, people will cease to believe in him". Well tennis's God has been cut and the remnants of the blood remain on the courts of Roland Garros, Halle and now at Wimbledon. I believe that Federer will taste success again. After all, Pete Sampras was a former tennis God who was bloodied by younger rivals and he managed to patch up his wounds, return to the battlefield, and win Grand Slams again. But the days of Federer's procession to victory are over. And that's no bad thing. Every king gets usurped eventually, it's the ever-changing nature of sport. It's why we don't just have one tournament and then draw a line under the whole thing. There's always someone new who wants to test themselves against the best. This doesn't have to be the end for the 'Fed Express'. What matters now is how he handles this change in his career. He may not be uber dominant, but he can still remain at the top of the mountain for a little bit longer. If he can reconcile the fact that he will lose more matches than he used to, then there's no reason why he still can't add a few more prizes to an already jam-packed trophy cabinet. The King isn't dead. Just wounded. But the sharks have the scent of blood in their nostrils and it will be intriguing to see how long Federer can fight them off before the inevitable coup d'etat. It happens to the best of them. Even the very best. With Federer gone for this year, the spotlight is shining more brightly on Andy Murray to take the grass-court throne vacated by the Swiss, especially after Murray's indefatigable win over Jo-Wilfried Tsonga. This attention could be a touch premature as Murray faces Rafael Nadal in tomorrow's semi-final. Desire and intensity will not be an issue. The Scot has such a burning lust to win one of tennis's top prizes that many say it will only be a matter of time before he does so. Indeed, the problem may be that he wants it too much. There is definitely something of the Captain Ahab about Murray when he's on court. Normally when Murray and Nadal face off in Grand Slam matches, they are compelling contests. They've played each other four times and are deadlocked at 2-2. Whoever comes out on top will be expected to lift tennis's most coveted prize come Sunday evening. I personally think Nadal has to be considered the favourite, and gun to my head, I would back him to win in four sets. But the joker in the pack is the state of the Spaniard's knees. He has admitted that they have been giving him trouble yet again, and after Wimbledon he may have to take an enforced break from the game. So if Murray can push the match into a fifth set, the momentum shifts. Nadal's on-court resilience surpasses even Murray's but the last time these two faced off in back in January, Nadal was hampered by injury and Murray made him succumb. To my astonishment, he retired on his chair as Murray had proved the stronger. While it was the only sensible decision he could have made, it must have hurt Rafa's pride to give up before the last point was won. Murray managed to bend tennis's Iron Man to his will once. To win tomorrow, he will have to do so again. Now I am an unashamed fan of Nadal but I will be rooting for Murray to confound my prediction for the match. Not only because he's a fellow Brit. Not only because it would be nice for the British press to focus on sporting success this summer. But because a Murray win at Wimbledon will stick in the throats of a lot of people on these shores who have indulged in a baseless 'ABM' (Anyone But Murray) campaign. To support a different player to win Wimbledon instead of Murray is fine. But to actively 'anti-support' somone, especially for no good reason is petty, infantile and pathetic. Thankfully Murray has never been the kind of guy to let such negativity affect him. But I for one will rejoice in these puerile morons choking on a jumbo serving of humble pie in the potential happening of the first British victory at Wimbledon for 72 years. If these people are going to behave like imbiciles, then they really should stop watching tennis and spend their time with football instead. The intelligence of those fans are a good fit for the 'ABM' brigade.